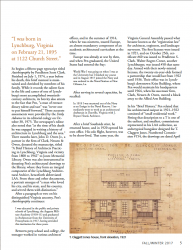 Lynch's Ferry Magazine | A Journal of Lynchburg History - Pen Clark’s Architectural Career Between the Wars by S. Allen Chambers Jr.
You are here: Archives » Fall 2017 » Pen Clark’s Architectural Career Between the Wars by S. Allen Chambers Jr.
Current page is 1.27.1: Pen Clark’s Architectural Career Between the Wars by S. Allen Chambers Jr. 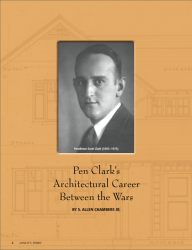 Pen Clark’s Architectural Career Between the Wars by S. Allen Chambers Jr.
After a paragraph or two on his distinguished Virginia ancestry, Pen’s Autobiography continues: I was educated in the public and private schools of Lynchburg, the Augusta Military Academy (1910-11) and graduated in Architecture from the University of Pennsylvania in 1917, having attended this institution for three years. Between prep school and college, the teenager worked in various architects’ offices, and in the summer of 1914, when he was nineteen, toured Europe, an almost mandatory component of an academic architectural curriculum at the time. Europe was already at war by then, and when Pen graduated, the United States had entered the fray: World War I was going on when I was at the University but I finished my course and in August 1917 joined the Navy and was ordered to the Naval Station at New Orleans, La. After serving in several capacities, he recalled: In 1919 I was mustered out of the Navy as an Ensign in the Naval Reserve. I immediately went to work as an architectural draftsman in Danville, Virginia with J. Bryant Heard, Architect. After a brief Southside stint, he returned home, and in 1920 opened his own office. His solo flight, however, was to be short-lived. That same year, the Virginia General Assembly passed what became known as the “registration law” for architects, engineers, and landscape surveyors. The first licenses were issued in 1921, and on October 25th, certificate #60 was issued to Pendleton S. Clark. Walter Rogers Crowe, another Lynchburger, was issued #58 that same day. Armed with their newly-minted licenses, the twenty-six-year-olds formed a partnership that would last from 1922 until 1936. Their office was in Lynchburg’s downtown Krise Building, where Pen would maintain his headquarters until 1964, when his successor firm, Clark, Nexsen & Owen, moved a block away to the Allied Arts Building. In his “Brief History,” Pen related that his architectural output in 1921–1922 consisted of “small residential work.” Fitting that description to a T is one of the earliest, and smallest, commissions represented in his LAA collection, an archetypical bungalow designed for T. Claggett Jones. Numbered Commission #154, the drawings are dated April 1921 and give Cleveland Avenue as the address. Apparently, the house was never built. No house resembling Pen’s drawing stands on Cleveland Avenue in Lynchburg, and city directories of the time list Jones and his family at other addresses. Pen had better luck with another commission that soon followed. Drawings dated July 1921 show a larger and more individualistic bungalow. Still standing at 370 Woodland Avenue, it was designed for Christian S. Hutter Jr. Drawings for both the Jones and Hutter commissions are rendered in ink-on-linen, a traditional drawingboard medium that Pen soon abandoned. Most of his later drawings are executed in a less demanding idiom: pencil on tracing paper.